For industries such as retail and pharmaceutical, it is imperative that products have complete life cycle traceability. Aerospace and automotive sectors have turned to “mark & read” solutions for engine parts in order to ensure complete traceability with the aim of eliminating potentially costly product recalls. It is also vital to make sure the right part is assembled for the right product. Achieving compliant production not only improves overall productivity and reduces operating costs, but it also enhances the chance of contract renegotiation and avoids costly and possible reputation-damaging product recalls. Guarantee the delivery of the right part to the right destination - Automotive component suppliers are under pressure to ensure the right customer receives the right part. Regulations and costly product recalls need to be avoided. 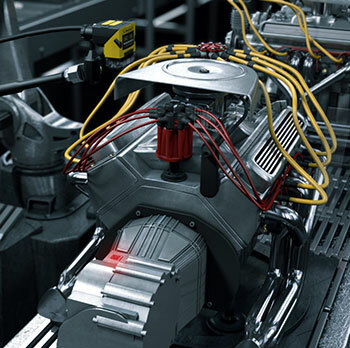 By implementing a traceability and identification program using both In-Sight and the Dataman 7500, an important international supplier could ensure that his customers, high profile car manufacturers were satisfied, while reducing scrap and knowing that each part was traceable from cradle to grave. Using DataMan 7500 on three different lines for final ID reading before distribution. Estimated cost savings on rectifying wrong deliveries per month per line = $15,000. A supplier of engines to the automotive industry discovered a faulty part in an engine. Owing to the fact that each of the parts had been marked and were traceable using machine vision, the supplier could track the faulty parts and limit the amount of product recall necessary. Each recall cost an estimated $400 and so they were able to greatly minimize the cost and, as a bonus, minimize customer dissatisfaction which would have cost even more to resolve. One product recall at $400 per engine limited to 500 engines instead of 2000.